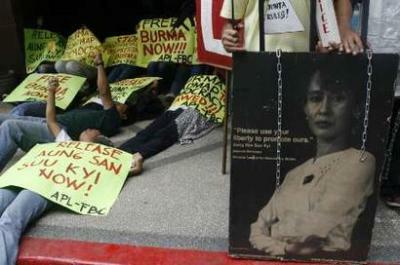 AS the trial of Daw Aung San Suu Kyi marked its second day, solidarity activists and workers under the Alliance of Progressive Labor (APL), an active member of the Free Burma Coalition-Philippines today held a protest action in front of the Burma embassy in Makati City and denounced the recent arrest and detention of world’s only imprisoned Nobel laureate. With huge replica of a cage and one protester dressed in pirate costume, activists dramatized the continued suffering of more than 2,100 political prisoners in Burma including Daw Aung San Suu Kyi. Reports said that security forces in Rangoon barred yesterday ambassadors of Britain, France, Germany and Italy including an Australian diplomat from entering the prison court. A spokesperson for Aung San Suu Kyi’s defense team said the court rejected a request to open the trial to the public and media. Daw Aung San Suu Kyi, has already spent 13 of the last 19 years under house arrest, and is nearing the end of the sixth year of her current internment. Daw Aung San Suu Kyi was transferred to Insein prison Thursday where she will be tried in a makeshift court inside the detention centre—if found guilty, her jail terms will be extended to another five years. The new charges stemmed from an incident last week which involves an American man John Yettaw who reportedly swam across a lake to Aung San Suu Kyi’s home and stayed there secretly for two days. Suu Kyi’s lawyer said the American, John Yettaw, had not been invited and that she had tried to send him away. “The workers stand in solidarity with the thousands of political prisoners in Burma who have been suffering day and night in the hands of a government that doesn’t respect human rights,” Bustillos added. APL said that the international community including the ASEAN and UN should immediately take bolder steps to directly engage Burma’s generals and to monitor the trial of Daw Aung San Suu Kyi. The group even likened the ruling generals to ‘pirates and bandits’ that recognize no law. “Pirates and bandits respect no law. It is predictable that the trial without the presence of international observers will not produce credible results. How could we expect the generals to observe international laws and standards? he stressed. “What we are seeing now is just a tip of a bigger iceberg. The ruling regime of Burma will do anything illegitimate to get legitimacy in power. Detaining and marginalizing Daw Aung San Suu Kyi and other people who oppose the government is the first step but the ultimate goal is to cement the junta’s rule to power by pirating the result of 2010 elections,” Bustillos explained. “The real issue is the continuing detention of the thousands of political prisoners who have been denied of a universal right to first face a decent court to defend themselves. This is the issue, not the junta’s sudden insistence of their law because a stranger came into the house of their no.1 prisoner,” Bans said.